Heat grill. In medium bowl, combine salsa and bean dip; mix well. Set aside. Sprinkle both sides of beef patties with seasoned salt. When ready to grill, place patties on gas grill over medium heat or on charcoal grill 4 to 6 inches from medium coals. Cook as directed on package or until patties are thoroughly cooked, turning once. During last 1 to 2 minutes of cooking time, place buns, cut side down, on grill; cook until toasted. 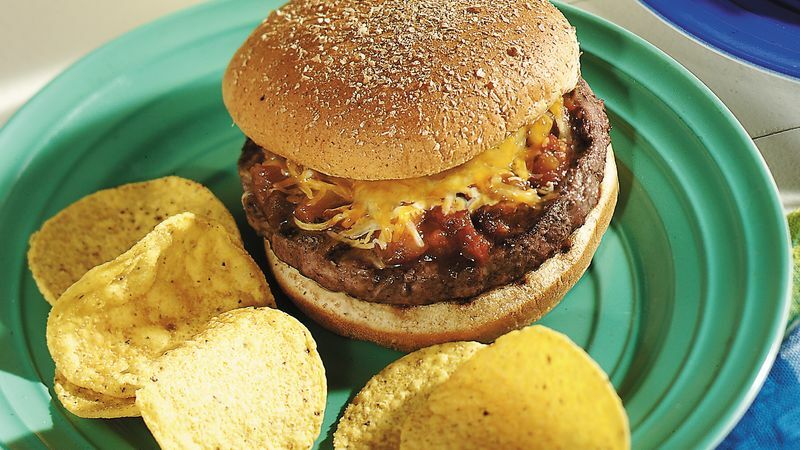 Top each cooked patty with salsa mixture; sprinkle with cheese. Cover grill until cheese is melted. Place topped patties in toasted buns.